Since I am a newbie vegan, I don’t have all the modern kitchen equipment or a pantry full of beautiful raw produce needed to make delicious and nutritious vegan meals. I am slowly, but surely getting there, but still have a long way to go before I’m 100% vegan-equipped. Luckily I came across the Wellness Warehouse’s LiveLifeWell competition where one South African contestant stand a chance of winning a complete LiveLifeWell Makeover worth R20 000! Over R5000 worth of beauty products and treatments. The sponsor list is to dream about: BodyPillow, Spine Align, Reviva Tech, Yoga Shmoga, Just Sports, Aromatic Apothecary, Dea Organics, Neotrading, Soaring Free Superfoods, Skinny Tan, Face 2 Fresh, Follow the Sun Yoga with Sharni Quinn, Nutritionist Kelly Schreuder, SleekGeek South Africa, and Paleo Monkey. 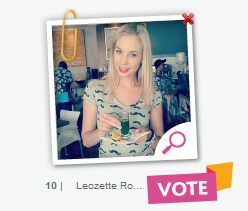 – Please VOTE for me to win & make all my vegan dreams come true? This is EXACTLY what I need to launch my veganism in the right direction and finish my transformation! But to win this fantastic prize, I need my veggie-friends’ help please??? I thank you all in advance… May the favour be returned upon you!